Posted on March 20, 2017 by Chiara Iacoviello. This entry was posted in Eating Well, Staying Healthy and tagged eating well, National Nutrition Month, snacking, snacks, Staying Healthy. Bookmark the permalink. To snack or not to snack? And what to snack on? These questions have probably crossed your mind many times as you’ve reached for the fridge door after a long day at work or as you headed towards the pantry during a relaxing evening at home. Is there a right answer? We asked Diane Javelli, clinical dietitian at the UW Medical Center, for her expert opinion, so that the next time hunger hits us, we know exactly which foods to reach for. Snacking is anytime you consume food or beverages between regular meals. 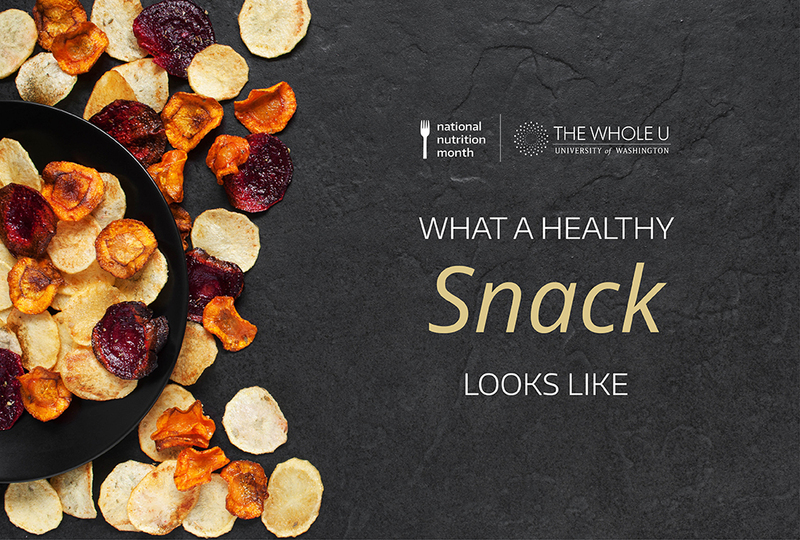 However, the word snack often conjures up thoughts of fast food, high sugar, salt, and not particularly nutritious items. While I believe all foods can be eaten in moderation, I encourage consuming nutritious snacks over junk foods the majority of the time. Is snacking recommended? Or is it better to have larger meals and avoid snacking? As to whether or not snacking is recommended, that varies from person to person. Some bodies work best when they eat small, frequent snack-like meals to keep them going throughout the day. This is especially true for folks who have long days and go for several hours between their main meals. Other bodies do just fine having three square meals a day. People who are very active typically need a snack after a workout. This is especially important for refueling the body with the carbohydrates and protein that it needs to rebuild. If you typically feel ravenously hungry or get low blood sugar between main meals, it may make sense for you to include a small nutritious snack between meals to prevent these problems. How many snacks should I have a day? And when should I have them (i.e. is snacking after dinner okay)? Again, the answer to this question is the amount that is right for you so that you don’t feel too hungry or too full either. Typically you can include 2-3 small snacks per day as long as you adjust your portion size accordingly when time comes to eat your main meals. There are various opinions about snacking at night. Most studies show that it does not affect weight or metabolic rate. However, if you are just snacking as a pastime and not because of hunger, then you really don’t need to eat. Also, for those with acid reflux, it is usually recommended that you don’t eat for a few hours before lying down. Those with Diabetes should check with your doctor or dietitian about the plan that is right to help control your blood sugar levels. What foods should I snack on? And why? Snacks should be enjoyable, easy to prepare, filling, and nutritious. Foods that are high in fiber, which contain carbohydrates for quick fuel, or which contain protein for satiety are good choices. Make it a habit to check the label (whenever possible) to get a better sense of the ingredients in the foods you are eating. What foods should I limit or avoid and why? Limit fast foods and highly processed foods whenever possible, because they tend to be low in vitamins, but high in salt, fat, sugar, and excess calories. Examples include soda pop, snack chips, fast food, cookies, candy, and ice cream. 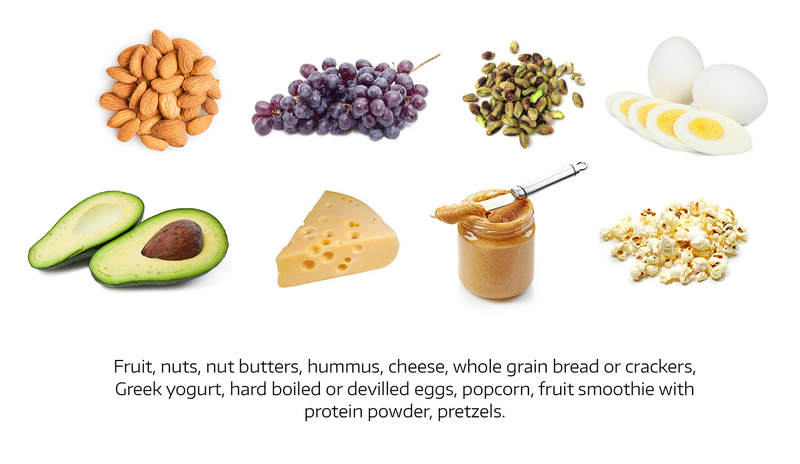 It’s okay to have these as once-in-a-while foods, but not as daily snack staples. Portion size depends on the amount of food individuals can eat in a day. Eat the amount that is just enough to control hunger without feeling too full. Active folks can typically consume more calories at meal or snack time. When in doubt, a good rule of thumb is about 200 calories per snack. Do you have any tips on planning snacks in advance to avoid snacking on the first thing we find in the drawer, pantry, or fridge? Popcorn without a doubt! I love it in any form, but when I’m on the go, I love to grab Erin’s popcorn (Hint: the Plaza Café has snack size bags). I also really like Dubliner Kerry gold white cheddar cheese and Nut Thins Crackers. Thank you, Diane, for giving us tips on healthy snacking! In case you missed them, here are our two past articles on what balanced breakfasts and lunches look like. This week, post your favorite healthy snacks on our Eating Well Facebook page to win one of an assortment of cool prizes!